In the country side you will find lots of signs which says "Ventas" it does not mean that the place is for sale (as well "venta") but it means a tavern or a pub and it is a very popular restaurant especially among the Spanish people. During the weekend the Spanish families go to the countryside to eat there lunch on a "Venta". The most popular dishes are game; deer, rabbits and pheasant. Around the lake you will find some of those Ventas, and it is important to be on schedule to get a table during the weekend where lunch is served between 1.30 and 4.30 pm. and the restaurant life is buzzing. Every Spanish bar with respect for itself has tapas, which were meant as a piece of bread which was placed on the top of a glass of wine or beer to keep the flies away in the old days. Ever since it has developed, "unfortunately" only meant as an appentizer but so tasty that you normally end up being satisfied before getting you proper meal. Spanish wine is very tastefull and districts such as Rioja, Ribera del Duero and Valdepeñas are known worldwide.The Spanish wine is devided into Crianza, Reserva and Gran Reserva. Gran Reserva is a mature wine where Crianza is young which also is reflected in the price. It is both fun and exciting to experience the local gastronomy and in every little village nearby such as Valle de Abdalajís, Ardales, Alora, Campillos og Teba you will find many different bars and restaurants where traditional Spanish dishes are served for little money. Looking for a more international cusine, you can choose a lovely night out in Antequera or Malaga. The small white villages nearby offers both idyllic village life and the perfect scenery for going sightseeing. But no sightseeing is completed before you have experienced the local food and their beverages. La Cantina. Cafeteria by the old dam. 4,1 km. El Kiosko. 'Venta' opposite House of the Engeneer. 4,7 km. El Mirador. 'Venta' with a beautiful view. 5 km. La Garganta. Restaurant in Barriada de El Chorro. 8 km. Los Atanores. 'Venta' in Valle de Abdalajís. 16 km. Good Spanish wine, tapas, fresh fish, paella and delicious salads. Delicious tapas and good Spanish red wine at small local restaurants or 'ventas' in The Lake District and in the small white villages of Andalusia. tapa tapas red wine local restaurant andalusian white villages paella. 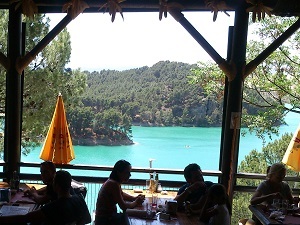 Nice local restaurants in The Lake District of Malaga and in the white villages of Andalusia.